Federal judge orders Trump administration to reinstate press credentials for CNN's Jim Acosta, at least temporarily. A federal judge on Friday ordered the Trump administration to reinstate press credentials for CNN's White House correspondent Jim Acosta, at least temporarily. US District Judge Timothy Kelly granted CNN’s request to restore the press pass for Acosta, giving him regular access to the White House grounds to cover events and press conferences, according to The Hill. "I want to emphasize the very limited nature of this ruling," Kelly said Friday in granting the temporary restraining order in favor of CNN. The White House revoked Acosta’s press credentials following his fiery exchange with Trump during a press conference last week. 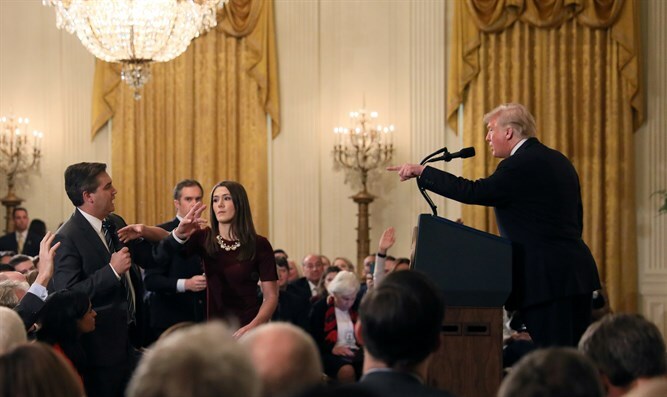 CNN, in turn, filed a lawsuit against the White House on Tuesday morning, arguing that the revocation of Acosta’s press pass violates their First and Fifth Amendment rights. Kelly did not rule on whether the administration violated CNN and Acosta’s First Amendment rights. Instead, he said Acosta and his employer have shown they are likely to succeed in their argument that their Fifth Amendment rights to due process were violated by the White House. In a brief statement to the press outside the courthouse, Acosta thanked Kelly for his ruling. “I want to thank all of my colleagues in the press who supported us this week and I want to thank the judge for the decision he made today,” he said. "Let’s go back to work."